Chassis assembly – coming together..
Good updates received today. 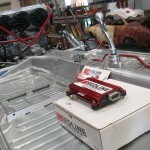 The Redline ECU was delivered. 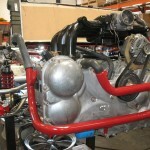 All parts have returned from powder coating and Kevin has installed the radiator frame and coolant pipes. 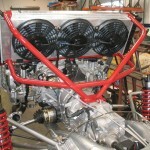 The motor was re-bolted to the transaxle as well. The car is really, really coming together although we still have a long ways to go. Next up – kafer bars, completion of the starter system, ECU installation, fuel system and finding some cheap tires. frontal view of the chassis, with brakes, radiator setup and black mamba shifter. Redline ECU (to be installed soon). Another view of the cooling system. Also, a good view of the CV/axle.